Dragon Age: Inquisition is the third primary entry in BioWare's Dragon Age franchise, released in November 2014. 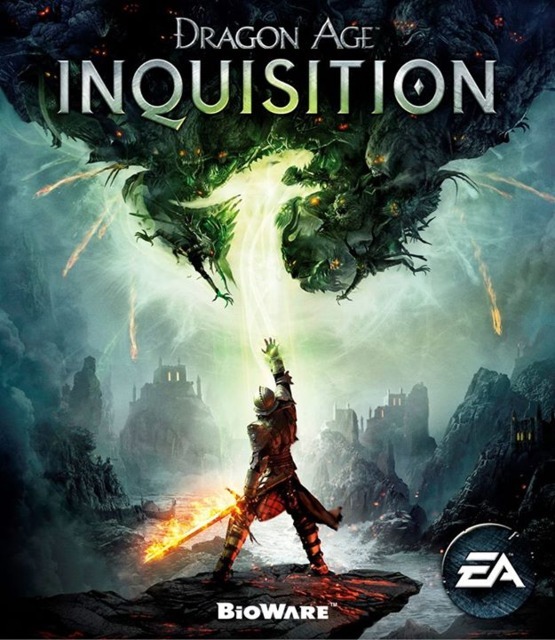 In addition to the PC, PS3, and Xbox 360, Inquisition marks the debut of Dragon Age on PlayStation 4 and Xbox One. It is the first game in the franchise to be developed on DICE's Frostbite 3 engine. Like previous Dragon Age games, Dragon Age: Inquisition is a dark-fantasy, 3rd person action-RPG, baring similarities to its spiritual predecessor, the computer RPG Baldur's Gate II. Playable as one protagonist and three of nine interchangeable A.I. companions (which the player can also take control of at will). Both the protagonist and the companions are all either a warrior, a rogue or a mage class, with some personal abilities/spells distinguishing characters of the same class. Some abilities can be combined for increased effects. Rather than decide between Dragon Age: Origins's strategical combat or Dragon Age II's action oriented combat, Inquisition allows for both. Players can issue commands and control companions in real-time in a traditional 3rd person action game viewpoint but can also pause the game in the top-down viewpoint, planning out actions and looking up information on enemies by highlighting them. New to Dragon Age: Inquisition is Focus. The protagonist and all companions accumulate focus into a single pool by doing damage to enemies. When a certain amount has been accumulated the player can pick any character and use a powerful ability or spell, not unlike Limit Bursts in the Final Fantasy games or Super Combos in fighting games. As with previous games, all classes have a health bar and a stamina bar or mana bar (stamina for warriors and rogues, mana for mages). Health does not automatically regenerate over time, stamina and mana does. Active abilities/magic spells cost a chunk of stamina/mana, upkeep abilities/spells locks a chunk away until the ability/spell is deactivated, draining abilities/spells sap away stamina/mana over time until there is none left. When a character levels up, the player can spend ability points to unlock new abilities/spells from differing schools and specializations of warrior, rogue and mage disciplines, or passive abilities that make the character permanently stronger in one form or another. Similar in concept to The Elder Scrolls V: Skyrim, BioWare has adopted an open world approach for Inquisition, encouraging exploration and undertaking side quests on behalf of local NPCs. Inquisition however is not one giant landscape but rather ten large, spacious locations, each one larger than all of the areas in Dragon Age: Origins or Dragon Age II. Constants in each location include local wildlife, plant-life, bandits and the occasional high-dragon, as well as other enemies. Hunting and foraging a given species allows another to proliferate in its place. High-dragons are battles unto themselves and are considered sub-bosses. BioWare has cited Persona 4, The Darkness and The Last of Us as inspirations for more realistic relations in Inquisition. The end goal will not be sexual relations dependant on an approval rating in which you can buy endless gifts for to raise (as was the case in previous games), but to develop bonds over time based on choices made and interactions with a given character. Characters are not pansexual in Inquisition. All potential romances have specific sexualities and cannot be romanced by anyone outside of those preferences. Four characters are heterosexual, three characters are bisexual and two characters are homosexual. Players will play as a new protagonist with customizable race, class, gender, and appearance. This protagonist, the Inquisitor, must save Thedas from itself by assuming control and building up an organization known as the Inquisition. The Inquisitor's quest will stretch across Thedas and into nations such as Ferelden and Orlais. Unlike Dragon Age II, in which the player was restricted to playing as a human character named Hawke, Dragon Age: Inquisition brings back many of the customization options from the original game's protagonist, The Warden. The player may choose to play as a human, elf, dwarf, or a Qunari--which is a first for the series--with the player's chosen race bearing some level of impact on the game's story and interactions with specific characters and groups. As in previous games, the player can also choose whether to play as a male or female, and as a warrior, mage, or rogue. Like Hawke The Inquisitor will be voiced, only this time players have a selection between two voices per gender; one being of an English accent, the other American. While the game features four selectable voices, Alix Wilton Regan is the one that was at the forefront of most of the game's marketing regarding The Inquisitor character. A Grey Warden whose drive to protect the innocent continued long after The Warden ended the 5th Blight in DA: Origins. Blackwall will prove crucial to conflicts between the Inquisition and the Grey Wardens, the latter of which have gone quiet and starting acting strangely as of late. An NPC from Dragon Age II, Cassandra is a skilled sword and shield warrior loyal to The Chantry and will make her playable debut as a companion in DA:I.
Cassandra was formally a Seeker of Truth and more importantly the right hand of the Chantry's leader, the Divine, dealing with threats to the Divine in broad daylight as opposed to the left hand, Leliana, and her stealthy behind the scenes approach. When the Seekers of Truth broke off from The Chantry to lead the templars into war with the mages Cassandra remained loyal and now joins the Inquisition to return order to Thedas. Formerly a human mage named Cole, possessed by a spirit (or demon), the being that continues to refer to itself as Cole has a natural blood magic ability that makes those who come into contact with him forget he was ever there. Due to his child-like mental state and supernatural existence Cole cannot be romanced. He hopes to be the catalyst for positive change for all of the Tevinter Imperium and joins the Inquisition to prevent the Imperium joining in the mage/templar war. Warrior renown even among the Qunari, Iron Bull fought the most dangerous opponents on every front line of any recent battle the Qunari fought. When he became burnt out and began suffering from post-traumatic stress disorder he was dispatched to Orlais to form a mercenary group not associated with the Qunari in order to spy on Orlais. Though he still remains loyal to the Qunari, unbeknownst to them in Orlais he has indulged in sleeping around, drinking and other practices that would've seen him executed in his homeland. Voiced by Freddie Prinze Jr.
An elven archer. Sera is a former member of an apparent group of rogues only mentioned in passing during one side-quest each in both DA:O and DAII known as the "Friends of Red Jenny". Sera is an anti-establishment character who delights in defying and meddling with authority, something the Inquisition will be doing with great regularity. An elven apostate Mage. Solas understands the Fade and its inhabitants more than any currently living being, proving vital for the Inquisition. Solas is a nomad beyond that of even the wandering Dalish elves. Living in utter solitude, Solas spends half his time in ancient places not seen by others for hundreds, sometimes thousands of years. The other half is spent in the Fade, discovering the past of these ancient places and those who lived during those times. Solas can only be romanced by female elfs. The first former companion confirmed to return as a companion in DA:I. Seeing first hand the chaos that was looming for the world in Dragon Age II, Varric joins the organisation he believes is looking out most for the common man, The Inquisition. She participates in Orlais's "grand game" of deception and hierarchy manoeuvring and is known for her sharp tongue as much as her magical power. The proud templar of prior Dragon Age games also returns to be a part of the Inquisition as an adviser. Cullen is romance-able despite his previous feelings for a female circle-mage warden, due to not being able to act upon said feelings. Cullen is not attracted to Dwarfs. Dragon Age II's protagonist returns to aid the Inquisition. Hawke's appearance and gender is customisable to represent how Hawke looked in any given play-through of DAII. Hawke visits the Inquisition at the request of his friend Varric to help with a situation involving the Grey Wardens. Due to events in DAII, Hawke has a strong hatred of blood magic. When first unveiled, Hawke was a female mage (all versions of Hawke are human). Hawke cannot be romanced, staying loyal to previous relationships from DAII. Making her debut in DA:I, Lady Josephine Montilyet is a diplomat for the Inquisition hailing from Antiva. She is of nobility and an ally of Leliana, who joined the Inquisition at her request. Josephine sees getting royal courts of Thedas on the side of the Inquisition as both a challenge to herself as well as the best hope to save Thedas. Returning once again for Inquisition, Leliana joins Cassandra from The Chantry to help The Inquisition as its spy-master. After departing The Warden's company post-Dragon Age: Origins Leliana has been seen as a secret agent for the Chantry's Divine in both Dragon Age II and Dragon Age novels. Leliana is not romanceable regardless of any previous romance with The Warden. Appearing to be providing assistance to the Inquisitor, Morrigan has been heavily involved in events of the Dragon Age world behind the scenes since her departure at the end of Dragon Age: Origins - Witch Hunt DLC. Recently Morrigan has become chief magical advisor to the progressive Empress Celene of Orlais during the Empress's ongoing civil war with her traditionalist cousin, the Grand Duke Gaspard de Chalons. Morrigan's Old God Child sired by The Warden in DA:O joins Morrigan in Dragon Age: Inquisition (only if the Warden also romanced Morrigan), having been named Kieran, if indeed the player chose to go through with the ritual in Origins. Morrigan's plans for Thedas is unknown as are her current relations with any members of the DA:O cast. Morrigan is not romanceable regardless of any previous romance with The Warden, either choosing the stay loyal to The Warden or simply ignore any attempts made by an Inquisitor. The Elder One - The primary antagonist of Dragon Age: Inquisition, who debuted in the DLC of a previous Dragon Age game. The Venatori and Red Templars are under his command, he seeks to become the new god of Thedas. Alexius - A Tevinter magister and former mentor of Dorian, Alexius refers to Dorian as his "final failure." He leads a band of Venatori in Inquisition. Due to the new console generation (PlayStation 4 and Xbox One) and Dragon Age: Inquisition's transfer over to the Frostbite 3 engine, BioWare have developed an alternative to transferring the varying Dragon Age worlds created by players from their playthroughs in previous games, over to DA:I, and onto future Dragon Age games. Dragon Age Keep is a web app that will launch prior to DA:I in 2014 and allow players to mould worlds as they see fit, defining their Wardens, Hawkes, companions and choices made in important moments in the Dragon Age world. Dragon Age: Asunder (written by BioWare's David Gaider), Dragon Age: The Masked Empire (written by BioWare's Patrick Weekes) and Dragon Age: Last Flight (written by fantasy author Liane Merciel) detail events between Dragon Age II's ending and Inquisition's beginning. Asunder covers the war between the mages and templars, The Masked Empire covers the civil war in Orlais and Last Flight covers revelations of the Grey Wardens, who have been silent since the 5th blight was ended in Origins. The continent of Thedas is in chaos. Orlais is deadlocked in civil war. The Circle of Magi have revolted and the Templar Order (led by the Seekers of Truth) have broken off from The Chantry to oppose the mages and anyone who would stand in their way. All is not well within the Grey Wardens and they have been mysteriously quiet. Dragon Age: Inquisition begins with an explosion which tears the Veil apart, that which separates the world of Thedas from the dream-world called the Fade, home to spirits and demons. Only one person survives, marked with the power to close tears in the Veil. A great number of demons from The Fade, new and old, now roam Thedas freely. An armed faction fighting on behalf of The Elder One. An extremist off-shoot of the Templar Order. The Red Templars uses powers not unlike Dragon Age II antagonist Knight-Commander Meredith Stannard and her corrupted red lyrium form. The Red Templars have subjected themselves to the corrupting and mutilating effects of red lyrium to utterly destroy their enemies. Dragon Age: Inquisition takes place in the fictional continent of Thedas. Thedas contains several sovereign nations that are at the height of society. These include Ferelden, the setting of Dragon Age: Origins, its on and off again enemy Orlais (who once ruled Ferelden for a century). There are also outlying mountain lands with older sets of peoples and traditions and ancient abandoned areas not seen for great amounts of time. The headquarters of the Inquisition. It can be upgraded over time as the Inquisition gains more power. Redcliffe Castle of Ferelden returns from Dragon Age: Origins. Redcliffe is the seat of the Guerrin family, namely the brothers Arl Eamon Guerrin and Bann Teagan Guerrin. Since their original appearance in Origins, Eamon has stepped down from his title and Teagan is now Arl of Redcliffle. A large forest area between Redcliffe and Ostagar in Ferelden. The Hinterlands is home to many refugees and currently a war-zone between mages and the Templar Order. A primary location in the Inquisition's efforts to end the mage/templar conflict. A large desert wasteland area in south-western Orlais, home to the abandoned Adamant Fortress, built by Dwarves and used in the past by the Grey Wardens during the 2nd Blight. They couldn't afford its upkeep once the Grey Wardens presence in Thedas began to lower. Like Mass Effect 3, Inquisition will feature 4-player co-op multi-player, unlike ME3 it will focus on dungeon crawling instead of horde mode. Players will play missions as agents of the Inquisition with the one of the three Inquisition advisers (Cullen, Leliana or Josephine) introducing the mission. Parties can consist of any combination of twelve characters, four variations of warrior, rogue and mage each. The multi-player will not have an effect on the single player. Loot is the primary prize for playing MP in the form of gold and items. Nothing you acquire in MP can be accessed in the single player mode. The multiplayer characters are all agents of the Inquisition. "Katari" means "One who brings death" in Qunlat. The Katari is a Tal-Vashoth mercenary who left the Qun in order to forge his own path. However, choosing one's way after being forced to follow orders is difficult. For the moment, the Katari makes his living as a sellsword, paid to fight for the Inquisition. His name is a description of what he does - While he has left the Qun, certain habits are hard to break. Korbin is a highly regarded warrior from Orzammar who volunteered for the Legion of the Dead. As a result of the alliance between the dwarven king and the Inquisition, Korbin now fights on the surface against Thedas's greatest threats. Tamar is a fearsome warrior. She developed her abilities by consuming dragon blood. One of the cultists living in Haven, she escaped the Chantry by fleeing into the mountains. Tamar was later captured by agents of the Inquisition and was given a choice: to serve or die. Execution in captivity would have been shameful. She'd rather die in battle; the blood of her enemies on her sword and a warcry on her lips. Belinda is a noble from Starkhaven and a recent initiate into the Templars, taking her vows just months before the Order split from the Chantry. Horrified to see the order she loved turn against the Chantry she believed in, she left the templars in order to stay loyal to the Divine. When Justinia V was killed, Belinda remained with the newly formed Inquisition, hoping to make things right. Luka remembers the prison in the Vimmark Mountains: She was nobody, clearing out tunnels for the Carta, not important enough to know the truth about why they were there. She watched as the Carta descended into madness, never learning who was pulling the strings. When Hawke destroyed the prison, she was trapped, alone and forgotten. It took years, but she got out, using salvaged treasures to blast her own exit out to freedom. Then the Inquisition came calling, for they too remembered the prison, and what was kept there. Hall is a survivor from the Wilds. A Dalish hunter rescued him from a bandit raid when he was a child and taught him her skills. However, because he was human the Dalish sent him away when he could fend for himself. Hall wandered for years never quite finding his place. Seeing the beam of light tearing the sky he followed it and found purpose in the Inquisition. Argent is named after the Orlesian word for quick silver. Trained from birth to be a weapon, she was often used as a bodyguard or an assassin by her various employers. Now the Inquisition is Argent's employer. Thornton is a veteran Ranger. An experienced soldier, he has served different masters, lived through several wars, and always lived to tell the tale. What the Inquisition faces now, however, is altogether different and far more terrifying, and it will take everything he knows in order to get through it. But he will get through it, because Thornton always does. Like Neria, Cillian was born to the Ralaferian Clan. In his youth, he lived apart from his people in order to resurrect a lost art, that of the Arcane Warrior. Originally driven by the need to seek glory for his people, Cillian's years of meditation and solitude gave him wisdom and respect for all life. When The Breach opened, he knew his duty was to stand against it, fighting to save all he knows and loves. Horrified by the abuses he saw in Kirkwall, Rion was one of the first mages of his Circle tower to take up the flag of rebellion. Seeing the amount of lives that the Mage Templar War had taken, he went to Heaven to await the Divine's outcome but when the temple was destroyed, his hope for resolution was lost. Rion signed up with the Inquisition; seeing it as the mages last chance for peace. Neria was born into the Ralaferin clan, and was chosen as Keeper Elindra's apprentice. Trained from youth to defend and serve people, she takes great pride in her magic and her role as Elindra's First. Now within the Inquisition as a Dalish emissary, Neria does all she can to see that the interests of the Dalish are not forgotten amidst the chaos. Raised in secret in Nevarra by a Mortalitasi mage, Sidony was brought up to revel in her magical abilities. She feels no kinship with mages who do not share her pride, and she has little but disdain for most other people. Sidony's only goal is to uncover her true potential as a mage, so she hungers for magical knowledge. When news of The Breach reached her, she headed directly to see it for herself, hoping that whatever secrets it held would be the key to her advancement. Inquisition will not be using BioWare Points from BioWare's website, all DLC will be purchasable and accessed through EA's Origin. Dragon Age: Inquisition was confirmed to be in development following a post from executive producer Mark Darrah on September 17th, 2012, and has been in development since 2010. Like its predecessors, Dragon Age: Inquisition will be set in Thedas and will feature a new protagonist. Whereas Dragon Age: Origins took place in Ferelden and Dragon Age II in Kirkwall (and the Free Marches), this time the adventure will span across all of Thedas. The game will be set after Dragon Age II and the novel Dragon Age: Asunder, in which both the magi of Thedas and the Seekers of Truth, leading the Templar Order, have broken off from the Chantry and prepare to go to war with each other. On the BioWare panel at Edmonton Comic & Entertainment Expo 2012, creative director Mike Laidlaw stated that "customization is going to be bigger than Dragon Age: Origins", and also include "follower customization". On the same panel, lead writer David Gaider mentioned that "You will be human", and that "backgrounds will be in Dragon Age 3 even though you will be human, it's not playable but it does significant impact on the story". (Gaider's words were later contradicted when Bioware revealed in August of 2013 that the player will, in fact, be able to play as an elf or dwarf.) Cinematic designer John Perry also stated that "he's had a longer pre-production on DA3 than any other BioWare project he's worked on". Perry also mentioned that "just one level in DA3 is as big as all of DA2's levels combined". At E3 2013, the first Dragon Age: Inquisition trailer was released with Dragon Age: Origins character Morrigan (voiced again by Claudia Black) narrating over war-zones featuring unspoken appearances by Dragon Age II characters Varric Tethras and Cassandra Pentaghast. Having foreseen (along with her mother, Flemeth) the chaos that the Dragon Age universe would descend into, Morrigan asks the new protagonist if he/she will save Thedas or lead it to its destruction. At E3 2014, BioWare demonstrated a relatively small area of Thedas called The Hinterlands, said to be bigger than all of Dragon Age: Origins (the larger of the 2 previous games) combined. Other locations announced included a return to Redcliffe in Ferelden from Origins and the second ancient Elven homeland, The Dales. The closed beta for the Dragon Age Keep began in early 2014 and continues up until its release in time for Inquisition. While initially planned for an October 7th US release, EA pushed its release to November 18th to allow more time for refinements. E3 2013: Will You Stand Against the Inquisition in Dragon Age?